Let's say you have limited growing space. Maybe you live in an apartment or condo and you have always wanted to grow beautiful smelling roses. You have never had the yard or garden area to grow them and wish you could. 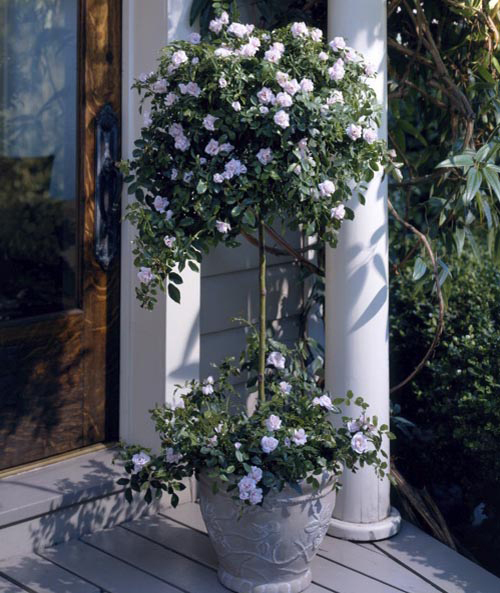 Well, potted rose bushes are easy to do and once and for all you will have your mini sweet smelling rose garden. Roses are very diverse with many varieties. Many of them can withstand cold temps as well and warmer temps. When purchasing your rose bushes to pot read the tags or talk with the local nursery to find the ones that are best for you area. 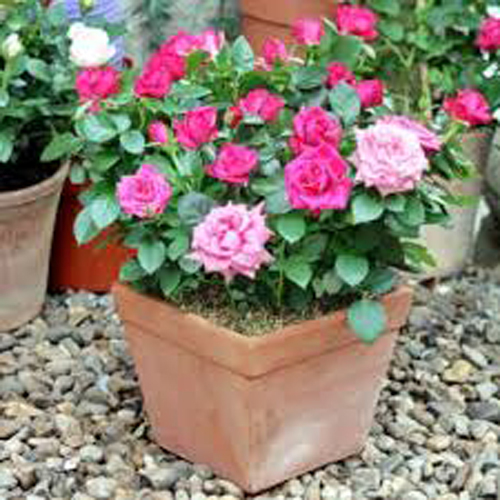 A favorite for potting is miniature roses. They are easy to grow and are perfect for small rectangle garden planters on a terrace or balcony. They usually don't grow more than 18" high so they will work everywhere. If you tend to lean toward the exotic, they are hybrid teas that pot up nicely. They have long, straight, sturdy stems and look lovely when planted in a colorful garden planter or pot. These rose are popular because of their large blooms. 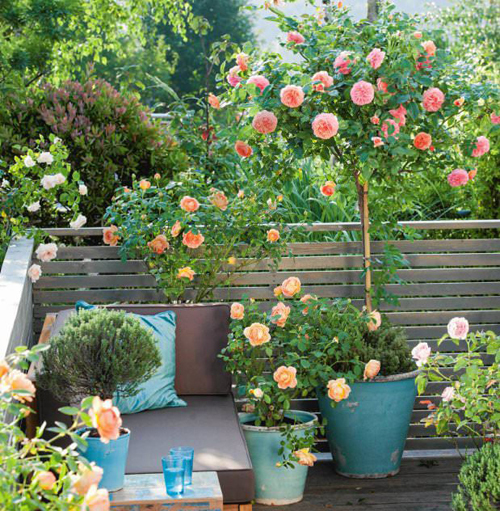 If you prefer a more bushy rose bush then we recommend Patio roses. They are compact and really like to be potted in your garden container. When selecting a garden container try to go a bit bigger than you thought. Some roses need deep planters because they have a hardy root system. The mini varieties not so much. When selecting the container make sure there is some room to grow so that you don't have to re-pot in one season. Make sure it has a drain hole. You do not want these roots to sit in water. If they do they will rot. 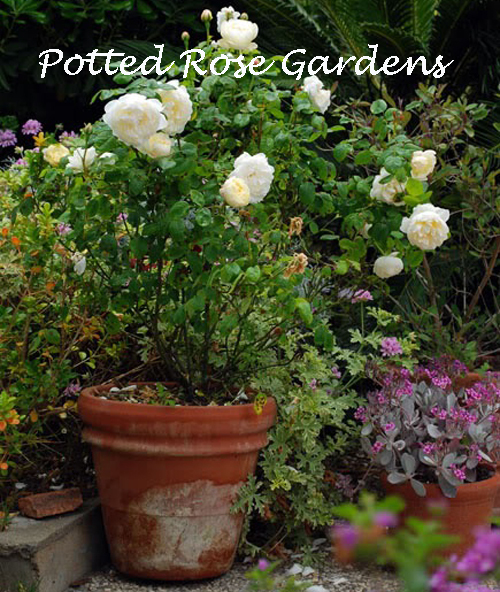 You need well draining potting soil specifically for roses if you can find it. If you buy the rose bare root, pre-soak them for a couple of hours in a bucket of water to loosen them up and make them adaptable. See how easy that is! Now you can select some beautiful garden containers and planters in colors and styles that you adore. Fill them with the type or roses you desire and create that rose garden you have always wanted.